DNA is the genetic material of almost all living organisms. DNA polymerase and RNA polymerase are two enzymes that work on DNA. DNA polymerase is the enzyme used in the DNA replication while RNA polymerase is the enzyme used in transcription. Both enzymes are capable of forming phosphodiester bonds between nucleotides. The direction of polymerization occurs in 5’ to 3’. DNA polymerase requires a primer for the initiation of polymerization while RNA polymerases do not require a primer. The main difference between DNA and RNA polymerase is that DNA polymerase produces a double-stranded DNA molecule during polymerization whereas RNA polymerase produces a single-stranded RNA molecule during transcription. DNA polymerase is the enzyme that synthesizes new DNA molecules from the DNA nucleotides in a process called DNA replication. DNA replication occurs in the S phase of the interphase prior to the nuclear division. It is a type of template-directed synthesis of DNA since the new nucleotides are complementarily-base paired with the existing nucleotides of the template strand. DNA replication is also a semi-conservative process where both strands of the double stranded DNA are used as templates for the DNA replication at the same time but in the opposite direction. Generally, DNA polymerase adds nucleotides in the 5’ to 3’ direction. Helicase is another type of enzyme involved in DNA replication, which unwinds the double-stranded DNA. The initiation of DNA replication requires a primer. A primer is a short strand (18-22 bases) of DNA or RNA, which provides a 3’ OH end for the DNA replication. Starting from the 3’ OH end of the primer, DNA polymerase adds complementary nucleotides of the template to the growing strand. The process of DNA replication is shown in figure 1. Prokaryotes contain DNA polymerase I to V. Pol I and Pol III are the two types of DNA polymerases that are responsible for the 80% of DNA replication. Eukaryotes contain polymerases α, β, λ, γ, σ, μ, δ, ε, η, ι, κ, ζ, θ, and Rev1. Retroviruses like RNA viruses use reverse transcriptase to synthesize DNA from an RNA template. RNA polymerase is the enzyme responsible for the synthesis of RNA molecules from DNA in a process called transcription. It adds RNA nucleotides in the 5’ to 3’ direction to produce the single-stranded RNA molecule. This RNA can be either messenger RNA (mRNA), transfer RNA (tRNA) or ribosomal RNA (rRNA). All three types of RNA are involved in the protein synthesis. The binding of the RNA polymerase requires the identification of the promoter of the gene, which is going to be transcribed. Upon binding of the enzyme, RNA polymerase adds complementary RNA nucleotides to the antisense strand of DNA. The process of transcription is shown in figure 2. Prokaryotes contain a single RNA polymerase type. However, eukaryotes contain five RNA polymerases: RNA polymerase I to V. RNA polymerase I is responsible for the 50% of transcription. It also polymerizes rRNA. RNA polymerase II is involved in the transcription of mRNA. tRNA, some rRNA, and few smaller RNA are transcribed by RNA polymerase III. RNA polymerase IV and V are exclusively found in plants, involving in the formation of siRNA and heterochromatin. Both DNA and RNA polymerase are two enzymes, which work upon DNA. Both DNA and RNA polymerase are capable of forming phosphodiester bonds between nucleotides. Both DNA and RNA polymerase add nucleotides in the 5’ to 3’ direction. The energy for polymerization comes from the hydrolysis of the phosphoanhydride bond between alfa and beta of the incoming nucleotide. Nucleotides are selected for the growing strand based on the Watson-crick base pairing to the template strand. 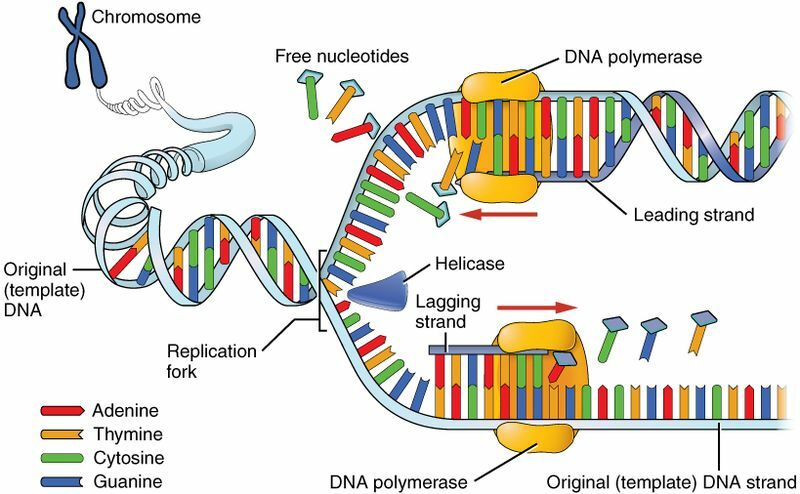 DNA Polymerase: DNA polymerase is the enzyme which synthesizes new DNA molecules from DNA nucleotides in a process called DNA replication. RNA Polymerase: RNA polymerase is the enzyme responsible for the synthesis of RNA molecules from DNA in a process called transcription. DNA Polymerase: DNA polymerase is used in DNA replication. RNA Polymerase: RNA polymerase is used in transcription. DNA Polymerase: DNA polymerase synthesizes a double-stranded DNA molecule. RNA Polymerase: RNA polymerase synthesizes a single-stranded RNA molecule. DNA Polymerase: DNA polymerase uses DNA nucleotides to synthesize a new strand. RNA Polymerase: RNA polymerase uses RNA nucleotides to synthesize a new strand. DNA Polymerase: DNA polymerase is active during the S phase of the interphase. RNA Polymerase: RNA polymerase is active during the G1 and G2 phases of the growth phase. DNA Polymerase: The binding of DNA polymerase to a strand requires a replication fork, which is made by DNA gyrase. RNA Polymerase: The binding of RNA polymerase to a strand requires its holoenzyme to recognize the promoter of the gene. DNA Polymerase: DNA polymerase requires a primer for the initiation of replication. RNA Polymerase: RNA polymerase does not require a primer for the initiation of transcription. DNA Polymerase: DNA polymerase possesses exonuclease activity. RNA Polymerase: RNA polymerase lacks exonuclease activity. DNA Polymerase: DNA polymerase synthesizes the entire chromosome. RNA Polymerase: RNA polymerase stops the synthesis at the transcription termination site. DNA Polymerase: E. coli DNA polymerase adds 1000 nucleotides per second. RNA Polymerase: E. coli RNA polymerase adds 40-80 nucleotides per second. DNA Polymerase: DNA polymerase has a less error rate. RNA Polymerase: RNA polymerase has a high error rate when compared to DNA polymerase. DNA Polymerase: Pol I and Pol III are the two types of DNA polymerases, which are responsible for 80% of DNA replication in the cell. RNA Polymerase: Eukaryotes contain RNA polymerase I to V. Prokaryotes contain only one type of RNA polymerases. DNA and RNA polymerase are the two enzymes responsible for the synthesis of DNA and RNA molecules from the genetic material inside the nucleus. 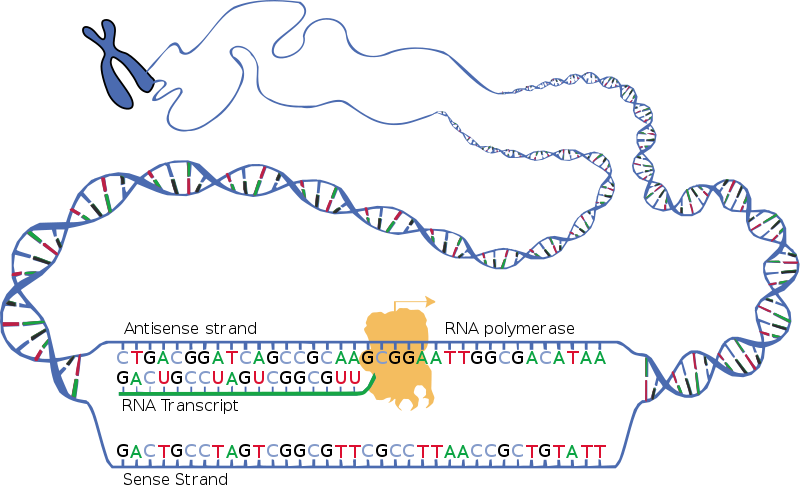 DNA polymerase is used in DNA replication while RNA polymerase is involved in transcription. The main difference between DNA and RNA polymerase is their function and requirements. 1.“DNA polymerase.” DNA polymerase – Biology-Online Dictionary, Available here. 2. Mandal, Ananya. “What is DNA Polymerase?” News-Medical.net, 23 Apr. 2014, Available here. 3.“RNA Polymerase – Definition, Funtions and Types.” Biology Dictionary, 29 Apr. 2017, Available here.